"A Whale of a Catch"
In FREE WILLY 3, Ten-year-old Max (Jason James Richter) joins his father in an illegal whale hunt, but after witnessing the innate beauty and grace of whales in the ocean, he changes his mind and opposes his father’s whale hunting. FREE WILLY 3 captures the scenic beauty of whales in the Pacific Northwest ocean and portrays a boy who is instrumental in changing his father’s attitude toward whaling. Beware of pervasive environmentalist philosophy. In this third installment of the successful FREE WILLY series, ten-year-old Max (Jason James Richter) bicycles through the scenic beauty of the Seattle waterfront, stops at his waterfront house and plays shoot-em-up with his TV set. Max’s father, John, (Patrick Kilpatrick), captain of the Botany Bay, a commercial fishing boat, invites him to sail with him and his crew on their next fishing expedition. The trouble is, Max’s Dad is out to catch whales. “My grandfather said whaling is God’s work,” says John, Max’s Dad. “Whale oil lamps brought light to the world”. John thus puts his son in a major moral dilemma, since whaling is not only illegal in the 1990s, it is also repugnant due to the near-extinction of whales throughout the world. Cut to the Nova, a pristine white scientific research boat. On board are Drew, a woman scientist (Annie Corley), Randolph (August Schellenburg), a weather-beaten Native American scientist with a pony tail, and Jesse, now a young man, who was the hero of the first FREE WILLY movie. Jesse hopes to track down Willy by sending out a computerized whale call from the Nova’s hull. Willy swims toward the Botany Bay. Seeing a quarry, John instructs Max how to use the ship’s harpoon to capture Willy. Max accidentally-on-purpose misses and falls overboard, where he encounters the whale and develops instant affection. The crew rescue the boy, who foils several harpooning attempts. One spear hits Willy’s tail, but Willy escapes. Willy responds to Jesse’s whale call and swims with his mate, Nicky, close to the Nova, where the scientists recognize the attempted harpooning and urge the captain to arrest John, whom they observe hastily concealing his harpoons. The Nova’s captain responds that he has no proof that Max’s Dad attempted to harpoon a whale and refuses to arrest him. Max and Jesse eye each other warily. Back on shore, Max becomes discouraged and throws away a beautiful whale’s tooth which his father gave him. Jesse sees him, recovers the tooth and follows Max to the library, where he accosts him. Jesse takes Max on a motor boat tour to see Willy and Nicky in the ocean, and they swim and frolic with Willy and his pregnant mate, Nicky. Meanwhile, Jesse and Randolph search for proof of John’s illegal whale hunting. At night, Jesse sneaks into the Botany and finds harpoons. The rest of the movie deals with whether or not Jesse and Randolph will catch John and his crew in the act of harpooning a whale. FREE WILLY 3 is cinematically beautiful, with lovely shots of whales swimming against the sunset and with stunning underwater shots, while the melodic theme amplifies the majesty of God’s largest presently living animals. However, philosophically speaking, FREE WILLY 3 promotes an environmentalist point of view, which often elevates the value of animal species above the value of human beings. 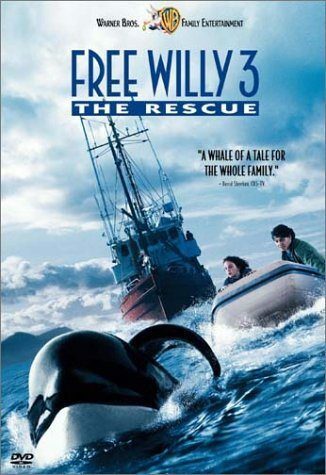 In one of the movie’s last scenes, John falls overboard, and Willy rescues him. “I wouldn’t do that − save someone who was trying to kill me,” says Drew. “I guess whales are better than humans,” retorts Jesse. Granted, poachers who break the law to hunt whales just because they can’t think of a legal way of earning a living are reprehensible, but it is also clear that the balance of nature s been upset and it is now necessary for man to maintain a new balance. Therefore, the growing number of some species of whales has prompted the appropriate international bodies to permit some whaling. This film does an injustice to the complexity of this issue. A more profound theme would have been to acknowledge that man has the responsibility to be a steward over creation. Furthermore, to assert that “whales are better than humans” is absurd. Moreover, to show what real love is, Jesus Christ gave Himself on the cross to redeem all mankind from sin and to save anyone who would believe in Him. As admirable as was Willy’s rescue of John, Jesus’ rescue of all mankind was infinitely better. (Pa, E, L, V, A, B, M) Pagan, environmentalist worldview of whaling in the 1990’s; 2 obscenities & 2 profanities; whalers shoot harpoons at whales, & boy & his father fall overboard; bar scene with alcohol; and, moral elements as boy reconciles with father. In FREE WILLY 3, ten-year old Max (Jason James Richter) joins his father in an illegal whale hunt, but after witnessing the innate beauty and grace of whales in the ocean, changes his mind and opposes his father’s whale hunting. FREE WILLY 3 captures the scenic beauty of whales in the Pacific Northwest ocean as it portrays a boy who is instrumental in changing his father’s attitude toward whaling. Beware of pervasive environmentalist philosophy. FREE WILLY 3 is cinematically beautiful, with lovely shots of whales swimming against the sunset and with stunning underwater shots, while the melodic theme amplifies the majesty of God’s largest presently living animals. However, FREE WILLY 3 promotes a point of view, which often elevates the value of animal species above the value of human beings. Granted, poachers who break the law to hunt whales are reprehensible, but it is also clear that this film does an injustice to the complexity of this issue. In fact, the growing number of some species of whales has prompted the appropriate international bodies to permit some whaling around the world. A more profound theme would have been to acknowledge that man has the responsibility to be a steward over creation.